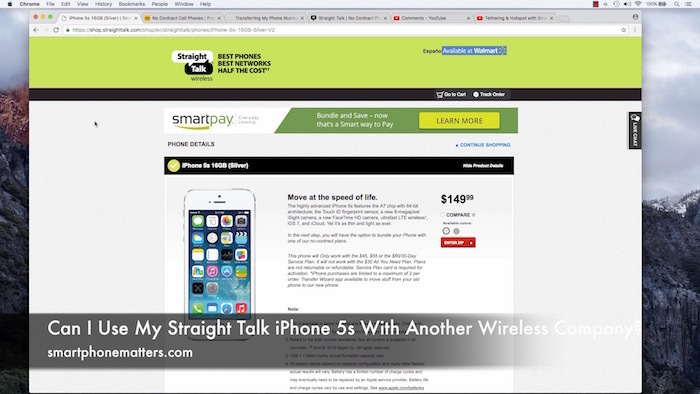 Recently a YouTube viewer, Leron, asked me if he could use his Straight Talk iPhone 5s with Total Wireless or some other prepaid wireless service. I have been asked this question a few times before so I thought I’d write this article. That is a good question, but my answer is sometimes yes, sometimes, no, so I think it just depends on a few factors. Let me give you a few things to check and try to find out if your Straight Talk iPhone will work with a different carrier. First, you asked if you can use Total Wireless. Total Wireless uses the Verizon network, and like all wireless carriers that use the verizon network, you’ll need to check the serial number or MEID of your phone on totalwireless.com to see if your phone is compatible. By compatible, I mean it can be registered and activated on Total Wireless. In my video, I show you how to check if your phone is compatible with Total Wireless. Now, if you phone isn’t compatible with Total Wireless, you may be able to use with a wireless carrier that uses the AT&T or T-Mobile network. Before doing this, you want to make sure your phone will work with either of those networks. The easiest way to do this is to find a friend using an iPhone with AT&T or T-Mobile and borrow their nano SIM card. If their SIM works in your phone, than your phone will work with that network. If it works with both the AT&T or T-Mobile network, the phone is unlocked. If your iPhone works with the AT&T or T-Mobile network, you’ll be able to transfer your service from Straight Talk to a BYOP SIM for a different wireless service. Once the SIM is activated, just put it in your phone. Now finally, if you aren’t able to register your Straight Talk iPhone with Total Wireless, and it’s not working with a borrowed SIM you have one more option. You may be eligible to have Straight Talk unlock your phone. Visit straighttalk.com and scroll down to the bottom. Click Unlocking Policy and fill out the form to see if your iPhone is eligible to be unlocked. You’ll also find a link with the details of Straight Talk’s (Tracfone’s) unlock policy. what we want to know is, if the phone is unlocked or if it can be unlocked easily. 2nd does it have a sim card compartment that will enable it to be used with T Mobile, at&T or Metro pc, if it does not have the compartment then it can only be used with Verizon or sprint. All iPhone 5s models have a SIM slot and are compatible with AT&T and Sprint. The phones however are activation locked. The phones can be unlocked after one year of service on Straight Talk. They may not be eligible for use on Verizon afterwards though.